For a bit of context, this video is a promo/trailer put together for the press conference of France Televisions at The International Animation Film Market (Mifa), which is the Market section of the famous Annecy animation festival in France. Annecy took place from June 9 to 14 this summer, so that's when the footage got its first exposure. The Vimeo video was uploaded on June 17, so it's actually been out for almost two months without anyone noticing the clip. Sometimes, really big news can be really good at hiding. I don't have time to say much more right now, but I will say this: I think the visuals look very good for television CGI. The animation is fun. It's appealing. It's even quite elastic. The teaser itself is funny and feels very much in character. And the voice... well, it's definitely a different take than a Don Adams impersonation (in other words, that's not Maurice LaMarche we're hearing), but I actually kinda like it. I don't need a dead-on imitation of Adams as long as the voice has the right charm and personality. Plus, maybe it WAS time for a change, considering that direct impersonations seldom manage to truly live up to the original. I'm hyped. How about you? There is now nothing that I am looking forward to in this reboot. The style is clumsy, lazy and too rubbery, he barely looks like gadget in this one, his coat is too short and his face looks utterly stupid, penny is alright but quimby and brain look wrong. Why couldn't they use the hand drawn style that was abandoned a few years ago. i hated that voice in mad grab and i hate it in the new show, it sounds like adam sandler doing a very bad impersonation of the poor inspector. If Maurice Lamarche was unavailable surely there was someone else that can do a decent Gadget. An inspector Gadget reboot could have been so good but they've blown it entirely... He doesn't even have his original Gadgetmobile, bet he has one of stupid talking ones. Awesome! Nice find, crazy this clip went undiscovered for so long. I like Gadget's model a bit more now seeing it in action. The squash & stretch effects given to the movements are nice and toony. Dunno how I feel about the voice yet, I want to hear more of it before I form an opinion. I wouldn't mind much if they went for something that was less Don Adams sounding. It'd be nice if they got someone that could retain the feel of the character while making it their own and that's hard to do while impersonating someone else. Hmmm...I'm on the fence as well with this new footage. Personally, I think the best Gadget to date was in the "Inspector Gadget's Biggest Caper Ever". I've rarely enjoyed an animated film as much as I did that one. If they can grasp at least a fraction of the animation, storytelling, and character design of "Biggest Caper", then they could have a winner on their hands here!!! Either way, thanks for keeping us Gadget fans in the loop, Mesterius! I, for one, cannot wait the see more! Like Cortoony, I like the squach-and-stretch quality of the animation, and I don't find the style "lazy", but rather deliberately done in a stylized manner. (I guess as far as secondary animation goes, you could critizice that the props don't move at all when Gadget crashes through the roof, but this IS just a teaser clip meant to show off Gadget.) Too rubbery? Personally, I find the rubbery effect to be just enough. (Whoa, Quimby's actually smoking the pipe for once in that advertisement!) Gordon's voice acting sounded a bit off. Not terrible, just the delivery came off as somewhat awkward. The voice in the audition clip is definitely an improvement at any rate, I'm eager to hear what it sounds like in longer lines of dialog. Hope you're having a nice vaction! I don't know how to feel. I was excited about the reboot a few years back but now it's been so long that I'm just indifferent. Cortoony: Yeah, there seems to be no problem with Quimby smoking in a modern-day game advert... maybe that can provide some hope for his pipe in the new show. ;) On the other hand, the "Mad Grab" game (which I recommend trying, by the way, even if I'm no gamer) is clearly designed specifically in the style of the original 1983 series; so that may be an explanation too. I don't think Gordon sounds *terrible*, either, he just sounds like... well... someone who is not really a professional voice actor. And I think the same goes for the other credited voice in the game - Dr Claw, played by none other than Phillip Stamp, the supervising producer of the new series! I actually haven't played far enough in the game to hear Claw speak (I assume he does somewhere, in some level), but I'm guessing it's also Stamp we hear in the end of this short ad for the game: https://www.youtube.com/watch?v=pXt_BW7AFpQ It's pretty easy to hear the difference between Frank Welker's dialogue and the new one by (presumably) Stamp, even if he is trying to sound like Welker. The interesting part is what this might tell us about the voices for the new series. The "Mad Grab" game was released in October 2013, and it has a voice sounding rather close to the voice in the new, animated teaser clip. 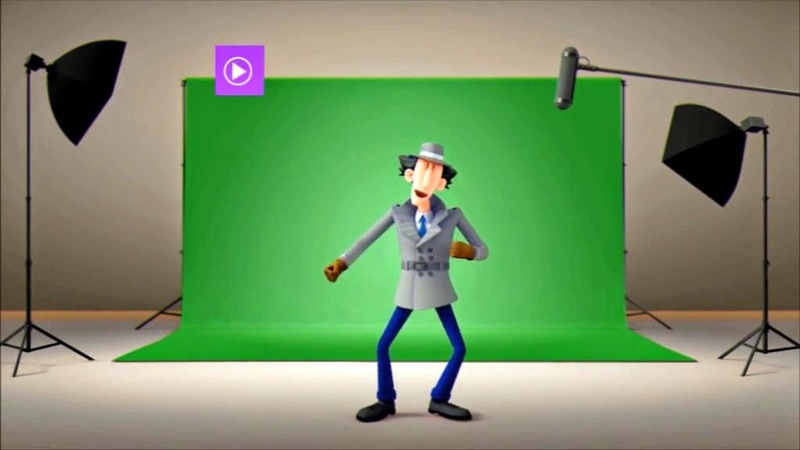 Which likely means that the casting choice for Gadget in the new series had been made at that time, since the game voice apparently tried to mimick the new voice actor. And of course, if Stamp's voice in the game ad indicates that Claw in the new series will sound like Welker... awesome. (Yeah, even if I'm open for new interpretations, I wouldn't mind a really well-acted Claw voice emulating what Welker did so well.) I just hope the voice in the new series sounds better than in the game ad. Because, again, that voice doesn't really sound to me like a professional actor. They did make make a strong effort with keeping in style of the original series. I'll definitely play it whenever I get the opportunity, unfortunately neither I nor anyone I know owns any of the devices it plays on. Games tend to not put a high priority on voice acting. They probably don't want to go through the trouble of hiring a professional for just a handful of lines so they got whoever was around at the time. Stamp's rendition of Claw does seem to suggest they're not straying very far at all from Welker's which is a good sign to me. The actors hired for the cartoon will be pros so I'm not too concerned about the amateurish quality translating over. Must've missed that post, I don't recall seeing the first one(with pirates and vikings) before. Gotta say, the animation is fairly decent and on model by advertisement standards. I don't understand the deal with the pirates and viking joining forces against Gadget either. I like how the viking guy at the end attempts to brutally decapitate Gadget in view of his family and then they all just laugh it off together. Anonymous: Damn, so THAT''s what I get for digging up hard-to-find news before anyone else talks about them... the fans grow indifferent instead of excited! :P Always nice to know how my attempts to contribute to the Gadget fandom works out. Seriously, though... as someone who's been reporting news and updates about this series ever since April 2012, I can sort of understand where you're coming from. There have been long periods of time between some of the first announcements; and certainly many moments where I, too, have found myself a bit indifferent about the new show, just because I knew so little about it and had no idea when it would be released, either. But we should keep one thing in mind: I started reporting about the new series the moment I found the first official mention of it... long before it entered full production and specific details were known. The first major announcements around the internet were not made before June 2013. I think this is actually telling us something quite common about how long a TV series can take to move through its development and production phases. And additionally -- for myself, I have felt the excitement and curiosity gradually growing back over the past few months, with new character designs and even teaser animation finally being released. :) But I assume the teaser clip up above didn't do anything for you then? Still not sure who's doing that Gadget voice, but I can tell it's not Maurice LaMarche. If they got an American voice actor, I always thought Billy West could be a decent option; I've heard him do a rather decent Don Adams voice before. Still hoping they'll get Cree Summer as Penny and Frank Welker as Brain and Dr. Claw! (and MAD Cat, to a lesser extent) But if there's an actor other than Brian Drummond they DON'T rehire to voice Dr. Claw, it's Don Francks. Well, we know that it's Tara Strong providing Penny's voice for the new show. As for Claw? No idea yet, but it'll be interesting to find out.